In order to guarantee maximum quality assurance, our quality controllers conduct stringent quality test on the products at our well-equipped laboratory. Fishing floats featuring welding joints are quality tested under high pressure conditions for leakage, depth and other related aspects. We make sure to use world class raw material while manufacturing the range of our textile products to ensure its superior quality and reliability. Qualified professionals employed by us keep them abreast with the latest market trends and adhere to quality norms while manufacturing our products. As a client-centric organization, we make sure to deliver premium quality products at our clients' ends. We have gained huge recognition across the globe in terms of consistent quality, effective supply chain, timely deliveries and ethical & transparent business practices. Consistent quality of our range of threads, cords and laces has helped us secure repeated orders from our valuable clients. As a part of our customer-centric approach, we provide our clients with free samples of the products before placing orders. Our ethical business values and transparent dealings have made us a key player in the major markets of Indian Subcontinent. For attaining complete customer satisfaction and ensuring superior quality of all the products, we perform various stringent quality tests under the assistance of quality controllers. The Fishing Floats having welding joints are tested under high pressure conditions for leakages, depth, etc. 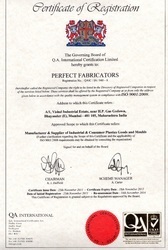 We follow ISO 9001-2008 management quality policy, as and when needed we seek help from various laboratories, test houses from private, government or semi government sectors.